It's a beautiful thing that God lovingly instituted a day of rest. The Sabbath rest wasn't something He made for Himself, but for us, because He knew we'd need it...we'd always need it. I'll tell you something that stands out to me about the Sabbath rest, and whether for you that is Saturday or Sunday this principle is the same. and enjoying the fruits of our labour. About ten or eleven years ago I bought the DVD set of Little House on the Prairie, and my youngest daughter Blossom and I would watch episodes in the early evening whilst teaching ourselves to embroider. This was the first time I truly appreciated how needful that day of rest was to a farming family, indeed any family in the 1800's where a six day working week was completely normal. Sunday dawned and Ma Ingalls would pack a picnic lunch, Pa would gather the family into the wagon and they'd drive the horse-drawn carriage into town to attend church. After the service many families would settle under the trees and spread their blankets, unpack the picnic baskets and share their picnic fare. The children would chase each other, parents would catch up on life, games would be played and much laughter was shared. After six long days of work, this precious day of praise and rest was indeed a God-send. I wish I appreciated the Sabbath rest the way they did. Sometimes I fall into a season where I've allowed things to pile up and work falls behind or family needs are pulling me in many directions...and what's the first thing to suffer? My Sabbath rest. I look at that 24 hours and think to myself, "I'll just do x, y and z and get them out of the way so I can rest the remainder of the Sabbath." Seriously? You'd think I'd know my own self better by now, right? X, y and z soon become the entire alphabet and before I know it the day has passed and I have to wait another six days before my day of rest will greet me again. Late last year I was diagnosed with some permanent health problems and they'll need to be managed the rest of my life so the Sabbath rest is even more important to me in the physical sense than ever before, but lately I've returned to pushing the boundaries (and suffering the effects) so in the weeks and months ahead I'll be planning ahead for my day of rest so that I'm not tempted to do more than I should. Just as God had the children of Israel gather extra Manna in the wilderness on the day before the Sabbath, ensuring there would be food for their day of rest, I too will prepare meals in advance. I'll also clear my planner, down all tools and put aside anything 'work' related to that day. To be honest, I may never be totally free of all distractions on the Sabbath day but as long as I learn to lay aside my work and not make work for others, that's a big step towards what I see as important in the big picture. Sometimes I'll go off with my husband, restfully picnicking by a creek perhaps, but all the time I'll go with Jesus, who's rest is the one my soul needs more than any other. I guess what I need to keep right in front of me is that this day of rest is a gift, given to fill a need I have which is too often overlooked. God only gives good gifts and the list I'm making of them keeps growing...how great the Father's love for us that He would do this, that He would set aside a day of rest for us even before He made us. How can we fathom the depths of such a love? 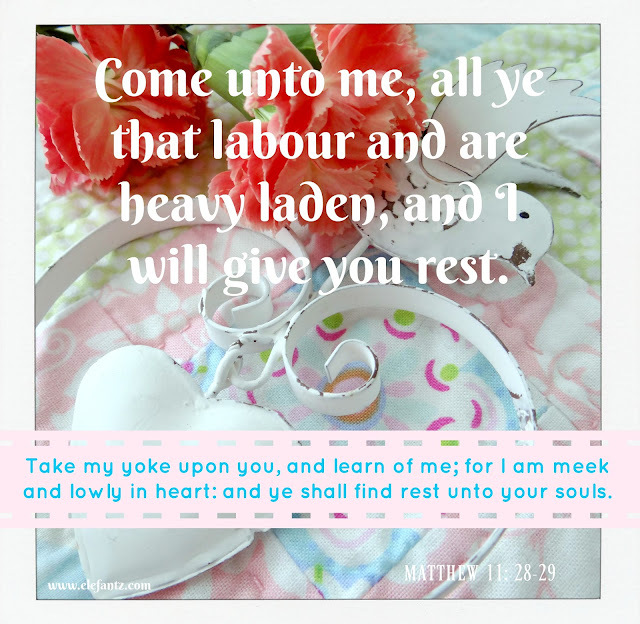 Are you weary and in need of the Sabbath rest? Beautiful post Jenny and I do try to keep the Sabbath as a day of family and rest even though I am now retired. I guess it was instilled in me as a child. I rarely am allowed to rest on Sunday. I am my mother's carer and she doesn't see the need. We have had words because I refuse to do the washing on Sunday unless the situation is dire. Hopefully bit by bit our Sunday's will quieten. God bless you and your Sundays. Lately I've been honestly wishing I had an 8th day every week so I could catch up- I think I needed to read your message, Jenny, as a reminder. I run like a crazy person and then wonder why I feel so drained. I look forward to my Sabbath day every week! I try not to do anything on that day that takes away from spiritual things. I attend church all morning, write notes to friends, do indexing and genealogy, sometimes even take a nap! I don't spend money, make money, do sewing or stitching, watch football games, or other distracting things. I keep beautiful music - classical or Mormon Tabernacle Choir - on in the background, and generally try to keep my life on the uplifted level for the day, to stock up for the week ahead. A picnic with your DH sounds delightful, enjoying some beautiful spot the Lord created. I think it makes a huge difference in how the rest of the week goes, and yes, I'm always ready to do it all again another Sunday! I don't know what I'd do without that spiritual storage time! I have realized in the last year how important it really is to rest on Sunday...early morning church and then we rest. The whole week goes better for the entire family when Sunday isn't so hectic. What a beautiful post to ponder. I think many of us, often short on time, overlook this beautiful blessing.